Interior trim kits – For Camaros equipped with the factory illumination package, Camaro’s accessory interior trim kits offer colors that enable owners to match or contrast the vehicle’s exterior color. They’re available in yellow, orange, white and silver. Interior accessories – A variety of accessories bolster both the style and convenience of the Camaro’s cabin, while helping maintain its original condition. They include floor mats, sill plates and more. The deluxe carpeted floor mats feature embroidered Camaro logos, while the sill plates add a distinctive appearance and added protection when entering the car. A cargo-area floor mat, cargo net and a smoker’s package are also available. Audio and electronics – Customers can take the Camaro’s technology to a higher level with upgraded audio and lighting systems, as well as remote starting. The upgraded audio system brings greater features and capability, while a peripheral device interface module allows portable players to play through the audio system. Remote starting brings the convenience of letting the vehicle heat up on a cold morning or cool down on a hot day. Also, Camaro’s accessory footwell and cupholder lighting kit delivers customizable, colored ambient lighting for a premium, high-tech interior appearance. Car covers – Protecting the Camaro from the elements and UV rays is easy with custom-contoured car covers. They are designed to fit the Camaro’s contours and are available in red or black – each with stylish, heritage-inspired black stripes. Exterior accessories – Customers can create a unique look for their Camaro with a diverse lineup of exterior accessories, from a grille insert and satin nickel fuel door to color-matched splash guards and a complete ground effects kit. And don’t forget to check out the stylish, wing-style rear spoiler. The ground effects package creates a dramatic, ground-hugging look for the Camaro, and comes in a great, Metallic Grey color that accents the car’s original color. The wing-style rear spoiler complements the ground effects’ competition-ready appearance. All Camaro exterior accessories are designed and manufactured to the same quality and durability standards as regular-production components. 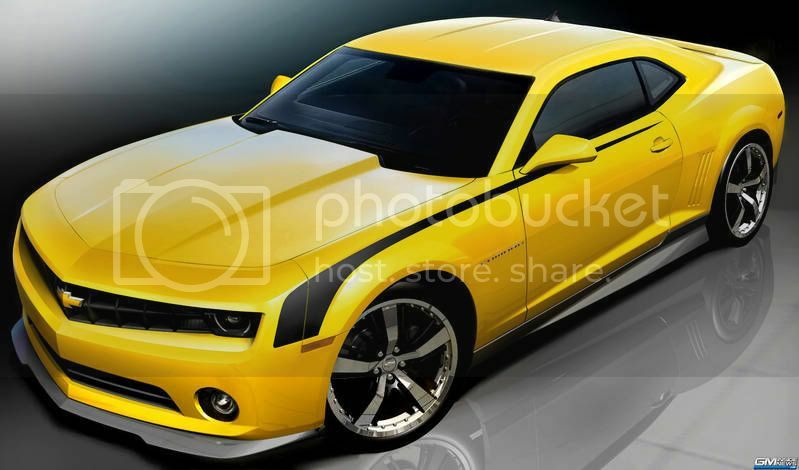 Stripe kits – The heritage-inspired 2010 Camaro is accented perfectly with accessory stripe kits. They give the Camaro a classic look and contemporary style. Available styles include hockey stick-style, hood and hockey stick-style and rally-style stripes in a variety of colors. Wheels and tires – The 2010 Camaro comes with a family of attractive, 17-, 18- and 20-inch wheels, but Camaro enthusiasts can take it a step further with great-looking, racing-inspired 21-inch wheels and complementing performance tires. The wheel design features a contemporary split five-spoke center that is available in two finishes. The first is a black-painted finish and the other has a machined-aluminum finish with black accents. They are offered in an 8.5-inch width for V-6 models; and 8.5-inch front and 9.5-inch rear widths for SS models. Center caps, chrome lug nuts and necessary tire pressure monitor sensors are available seperately. For convenience, complete kits of wheels, tires, center caps, lug nuts and pressure sensors are available. Performance parts – GM Performance Parts (GMPP) designers and engineers worked with the Camaro engineers to develop emissions-legal bolt-on components that would accentuate and enhance overall performance. GMPP developed air box, header and exhaust kits, as well as complementing short-throw shifters for manual-transmission applications. Also available are color-coordinated engine covers that add a dash of color-coordinated style under the hood.All the components are 50-state emissions legal, with CARB EO numbers where required.